"Kalakaua Merrie Mile = A whole lot of fun! " I’ve never run a mile race before and jumped at the chance to run the Inaugural Kalakaua Merrie Mile since I was doing the Honolulu Marathon. This race is so much fun, great for families and perfect to say you have run Waikiki!! Online and easy, it was about $35 for entry, and I think the late registration was $45. Registration closes a couple of weeks before the race however you can sign up at the expo if you’re around Honolulu, which a lot of people did. Held in the Honolulu Convention Centre, there is a seperate table for the Kalakaua Merrie Mile entrants opposite the Marathon tables. Parking: Public parking is available at the Convention Centre. It was $10 and there were plenty of spots. You get a shirt when you pick you your bib, and it was one of the nicest race shirts that I’ve seen. It’s a nice technical fabric tee (red in colour) with the Kalakaua Merrie Mile logo on it. You also get a medal with the logo of the Mile at the finish line - which was a nice surprise! A simple out and back, the race starts at Kapiolani Park, goes up 800m along the beachside and then returns to finish on the beach! You are meant to line up by the colour on your bib, which shows a time scale that you’ll run the mile in. It did get a bit confusing at the start since there weren’t any colour signposts of where to go and it was just honesty that made people wait for their coloured start. In the end it didn’t really matter. So. much. fun!!!! Everyone is there to have a good time and run a mile. There are costumes, people of all ages and then the elites. I really liked watching the elite race after we all had finished, you generally don’t get to see them in a race if you’re down the back!! Once the racing had finished, the party started with some great Hawaiian entertainment and so much food! People were walking away with cartons of snacks! There was a bit of a queue by the time I got around to the finish (10:30 for a mile), so I skipped the majority of the food. I don’t think I’ve smiled so much before in a race! I definitely recommend to anyone who is in town for the Marathon, or vacationing! Perfect for families too! 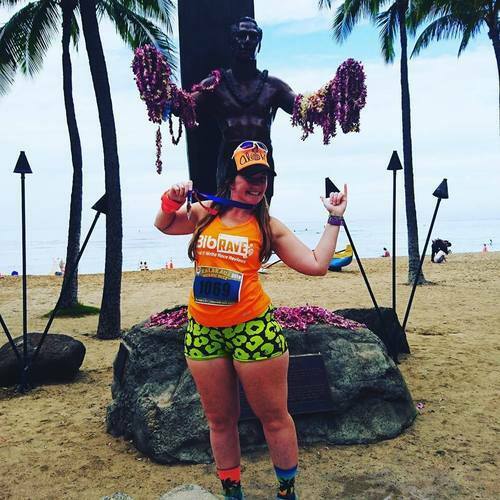 "26.2 Miles of Aloha! " This is only my second Marathon, but the Honolulu Marathon did not disappoint. It really is 26.2 miles of Aloha! Online and easy, there’s seperate options for US/Canada entrants and International which does mean different prices, and you aren’t able to ship any of the In Training goodies to Australia. Registration closes a couple of weeks before the race however you can sign up at the expo if you’re around Honolulu! Held in the Honolulu Convention Centre, this expo is like none other! When I say it’s on a grand scale, I truly mean it! You pick up your bib by walking up to the numbered tables, while the volunteers sort through a box of bibs. You are handed your bib and off you go (make sure you get it tested out to see that the chip is working). You need to make sure you stop by the gear bag table on your way out of the registration pick-up area, they’ll find your numbered sticker and put it on a clear bag, ready for you to fill! The registration area filters into the official merch area - not only is it huge, but there is (almost) everything there! Shirts, hats, towels, plush toys, you name it! All the other vendors are located behind these areas and you’ll find everything from nutrition, compression and lots of medical supplies. There were even Mitsubishi mascots ready for a picture! Since the Japanese market is a big focus for the race, there was plenty of Japanese only booths giving away Honolulu Marathon merchandise. I must admit, I was a little jealous of the Honolulu Marathon specific Line stickers you could get! I loved that there were so many picture opportunities and everyone was so excited to be there! The feeling was electric at the expo! Public parking is available at the Convention Centre. It was $10 and there were plenty of spots. What I really liked about Honolulu Marathon is that you didn’t know what the medal or the finisher’s shirt looked like until you finished. I know that some people like to know what they’re training towards but I think that seeing at the end makes you focus on the effort of running (or walking) the full distance, rather than the reward at the end. Also upon finishing, and before you get your medal, you are presented with a shell necklace which is a very cool unique to Hawaii aspect of the race. Corrals: Here’s where it’s interesting. Apart from elites, it’s pretty much all self-seeded. Just fit yourself in amongst the other 30,000 people! I found the 5.5hr - 6 hr marker but it really was a mix of full walkers, runners and the 10k walk people. The race starts to fireworks at Ala Moana Park, next to the shopping centre, and heads through Downtown Honolulu, back up past the Government buildings - which have the most AMAZING Christmas lights going on (trust me, a lot of people stopped here) - and through Waikiki. You’ll actually pass the park where the finish line is and this is where the 10K walk finish line will be. For full runners, it’s still another 20.2 miles/32.2km to go! Following the road around Diamond Head is something that must be experienced, not only are you running around a extinct Volcano, but it’s known as High-Five Hill - with some of the most enthusiastic volunteers you’ll ever meet! Once down the hill you’ll make a series of connections with the course coming back, separating through Waialae Kahala and Hawaii Kai (where you’ll loop and start your way back). The highway miles/kilometres were great as the crowds of people made their way through the course. There was definitely plenty to see! The drummers on the hill back up the road around Diamond Head were fantastic, and you definitely got the feeling that you were almost there! The final run down to the finish line is like nothing else. Completely straight with supporters and other runners packing the sides, it definitely gives you that last push to the finish! The finisher’s chute is pretty straight forward, you receive your shell necklace, medal and then you can head to the showers (if needed). There are different spots set up for the post-race food (and the most amazing Malasadas you will eat) and the finisher’s shirts so make sure you’re familiar with the village. There’s big tents set out for the groups, and another tent for merchandise. The gear check bag tent had no line which is perfect when you’ve just ran that distance! Every 2 and a bit miles, a few were signposted that they were coming up. The aid stations offered water and Gatorade, there weren’t any stations that offered food or gels (although there were plenty of people offering trays of pretzels on the course). Medical stations were also set up at each aid station, offering Vasaline (and a reminder not to eat). There were two locations on the race when I came through which offered Suhotap spray, the best I can describe it as a spray which numbs any pain you may be feeling. Apparently you can only have it 2-3 times a day. There were also a couple of stops that had sponges and these were desperately needed! It was humid and hot during the race, and there was a big risk of overheating. I was training in my summer (Dec) and thought I’d be ok, but felt like I was getting too hot. You must have a plan to manage the heat, and found that there were aid stations with bags of ice on the side which you could put in a ziplock bag. This, along with dunking my BUFF in water at every aid station made my run a lot more comfortable. While there’s no focus on entertainment to keep you busy during the race (with the exclusion of the drummers on the way back up Diamond Head), the atmosphere is absolutely amazing! It feels more like a big 26.2 mile party - so many people cheering on the sides and everyone excited to be in Honolulu! I loved hearing the crowd cheer on all the runners and people holding their hands out for high-fives. With no time limit to finish, there are a lot of people who walk the course, which is incredible, so there’s lots of people around if you’re running over 5 hours. A BIG cheer for the volunteers, they were amazing during the race, especially going up High-Five Hill. Also a big cheer for the first-responders who were keeping a close eye on the race. Overall, this race is an amazing experience, and I felt that the course went by so quickly. You can’t help but be super happy running in paradise, the course views are incredible and the people are even more so! The race is extremely professional, with every consideration in place to combat the heat. I enjoyed every step of the Honolulu Marathon and this is one I’d consider again! This is my local race and is definitely not as flashy as the "big city" races. I held back registering until the final days - the race had a limit of 900, and this year they came very close to reaching that limit! In concern that I was going to miss out, I registered and unfortunately something happened with my registration. I waited 2 days to see if the confirmation had come through, contacted the race organisers, luckily I screen printed my receipt as I was able to confirm that I had paid and my registration was found!! Phew!! Expo - Packet Pickup is normally the day before at the gym that sponsors the race. This year I didn't pick it up the day before, but decided to get to the race early. They did offer a race day pickup which was easy, and no lines! At the start line there was a stall set up by our local running store selling everything! Swag: No swag, but entry is super cheap (about $50) so it's all good! You do get a medal at the end! Course - This is a fast and flat course around Tuggerah Lake, from The Entrance through to Chittaway Bay on the shared bike/pedestrian pathway. It's important to note that while the race does indicate on the path that the race is happening, it's still a public space so you do get people walking their dogs and riding their bikes when the race is on. Now I didn't have the best race and ended up towards the end, so there wasn't too many people around in the race - more just spending their leisurely Sunday morning walking around the lake. This course is my usual running route (+ a bit more) so I was quite familiar with the distance markers (they're spray painted on the ground). The finish area is in Memorial Park in the middle of the town on the waterfront so there's lots of people around but this year they had so many volunteers helping runners out to keep on course! Aid stations: The aid stations are manned by the local running group and they were awesome! Not only dishing out water (I think there was a Gatorade-type drink available too but I don't ever take it), but support as well! I even was offered a beer at the 4km to go aid station (I must have looked like I needed it!!). There were no portaloos on the course but there are real council toilets located at different locations around the lake. Finishing area: So the "cut-off" is 3 hours, and I finished in 3:01. They were starting to pack-up the timing mats when I came through - and I felt for the people who were behind me, some of who were running for charity. They were still handing out medals which was great, but unfortunately I didn't get any food (it was all gone by the time I got there) but one of the ladies ran out and greeted me with a bottle of water which was so nice! There were food stalls around the park, but I was so exhausted that I was ready to go home. This race is always the last weekend of November, and for some reason has a start time of 7am. The past few years that I have ran this one it's always been super hot, and this year was no exception. The conditions were absolutely miserable out there as it really is a hot course (even though you're weaving in and out of trees). Hopefully the start time gets changed to 6am (or earlier) so we can avoid the heat as this is the only thing that lets this race down. 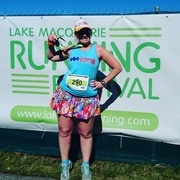 "A scenic half marathon! " Wow, what an awesome race experience! It's a big city race with that nice small town feel! 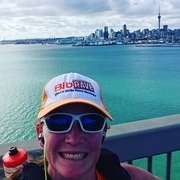 The Auckland Marathon (Half Marathon) has been a bucket list race of mine and I've seen it sell out in previous years so was straight on it when registration opened in 2016. Registration: I registered online and there was seperate pricing for AU/NZ and other internationals. Online registrations closed the week of the race, however at-the-expo registration was occurring. Expo: You can't get a better place in the world for an expo than on Auckland's Harbour! It's an amazing location with the greenest water. Located in the Viaduct Events Centre (and opposite the main sponsor ASB's head office) the Expo wasn't too overwhelming but delivered. Packet pick-up was a breeze, with seperate sections for the 5K, 12K, Half Marathon and Marathon races. As you walked through to the expo side your chip was checked to make sure there were no issues on race day. As usual the sponsors had the biggest spots - ASB offered taping for the customer's or with a donation to charity, Asics had their retail set-up and there was a range of other races & vendors. Swag: You received your packet in a yellow Auckland Marathon bag, which was intended to be your gear bag. What I liked at Auckland Marathon was that your bib & gear bag tag was actually in a seperate sealed plastic bag which also included race instructions. You were also given your transport band (for ferry or bus dependent on the race). All participants received a race shirt, which was Asics branded and had the Auckland Marathon logo on it, followed by the specific race. While the race provided a size chart and said the style was slim fit, these were really slim. I picked up my medium however couldn't even get my arm through the sleeve! The event organisers were super proactive about the issue and communicated that we could change (unworn) shirts after the race at the finish village. I ended up with a 2XL for a nice casual fit (which fit like a M/L). Transport: I stayed in a hotel close to the Queen St Ferry Terminal, so it was no issue walking over at 5:30am. Ferries for the Marathon & Half Marathon runners started at 4:20am and finished at 6:30am - leaving every 10-15 mins. Boarding the ferry was quite a simple process, and there was plenty of boats leaving around 5:45 for the 15 min journey over to Devonport where the race starts. Amenities: There was plenty of amenities at the start line - so many portaloos which made for small lines! The bag drop was simple - place your bag (with the gear bag sticker on the handles) in the corresponding orange bag with your bib number. At the end they'll be laid out ready for collection! There was no corrals at this race, rather a self seeding process with estimated finish time placards listed at the side of the start line. The race was for both runners and walkers (designated by their different coloured bib). 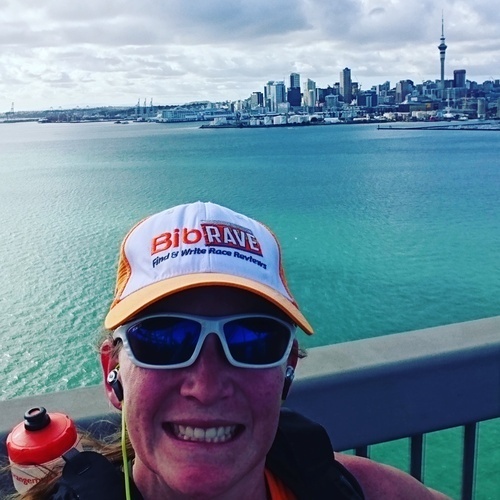 Course: I'm so glad that I explored Devonport the day before the race so I knew that it would be hilly in the first lot of kilometres! The race itself starts on the flat, just in front of the North Head Volcano Cone, on the shoreline (amazing at sunrise! ), we then head towards the North Shore and make use of the transit areas (where they close off at a certain time and bus those to a further point on the course) before hitting the bridge at about the 14km mark. And this bridge is NO JOKE! What was awesome were the drummers at the bottom of the incline which really lifted the spirits - as well as encouraging those who wanted to Blitz the Bridge - for the half hour competition that was running. After coming off the bridge there was another hill, before hitting the 16km mark and it was flat to the finish! The only part of the course which I felt was bare was around the 18km mark when you're running in sort of an semi-industrial area before hitting the Viaduct. There were a whole bunch of supporters lining this part of the course though which was great! In fact, the crowd support was awesome, with so many Aucklanders getting up to cheer on the runners! Finish: The finish area was awesome! Marathon and Half Marathon runners both received medals, after picking up a banana and Powerade (if that's your drink). There was no water offered sadly. Luckily I had some extra in my Orange Mud pack! I headed straight to the Runners Resources area to change my shirt - since it was the longest line I assumed I was in the right spot - it only took about 10 mins to exchange shirts. All the sponsors and charities had big set-ups which encouraged people to stay the whole day. It was a great environment to relax and have something to eat! Overall this was such a great big city race - it was still very personable, rather than be a huge race. The course is scenic, and I'd imagine the marathon would even be more so since it goes through the city. At parts of the course the road was shared with traffic, separated by traffic cones so care was taken by all runners to not push and overtake each other with caution. I would definitely run this one again, and if you love travelling to race put this one on your list! "A fun local race! " 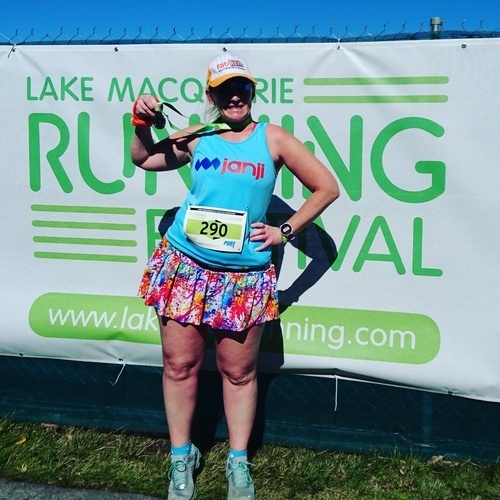 I was always intrigued by the Lake Macquarie Running Festival but hadn't ever had the chance to run in it since I've normally been in the US for a race. So this year was my year to run it! Registration: I registered online, but I believe that registrations were also being taken on the day. I can't remember the exact amount but it was under $100 to register for the race. There was the chance to pick-up your packet the weekend and the day before at the local running shop. Swag: You got an event shirt with your entry. This year it was a fluro green colour. Course: The course was an out and back 10.5km course so it was two loops, but with the race starting just before the finish line, you essentially passed that finish 4 times before you are finally done! The course itself is absolutely picturesque, incredibly flat and on closed roads around Lake Macquarie. There are a couple of points in the race where you are on grass crossing a park (same park just out & back x 2) and the turnaround point is in an industrial area. All aid stations are well manned with plenty of water. They had to reopen the road at a certain time, so detoured people to the path along the lake - which was much prettier than the road - but no different in distance! I was the first one to be detoured (I was actually asked which way I wanted to go) and the volunteers provided a bottle of water since there was no aid stations on that part of the course. I ended up making up time and places down on the path, and popped out with 1km to go, where I joined the course to the finish! The locals do come out and cheer for all the runners, which is great to see too! Amenities: Since the start/finish was in the same location and located in a park the bathrooms real ones, which made for a bit of a line at the beginning. There were a couple of food vendors but plenty of cafes in the area. The local running shop also had a big set-up out the front of their store. This is a great local race and extremely flat which makes for a fast course, but if you're not a fan of loops (or seeing the finish line 4 times) this may not be for you. Would I run it again? Yes! I love supporting local races and it is a nice and professional event.